THE GREAT FRAME UP $150.00 – ANY SIZE PAINTING. CHOOSE A FLAT FEE FOR ANY SIZE PAINTING – NO KIDDING. FRAME YOUR HEART OUT. So, first you have to ask yourself, “Do I frame or not?” If you do decide to frame, this leads to what style, color/finish, which are all good questions to ask when you contemplate framing. Basically, it all comes down to choice. From a designers point of view- definitely frame. Consider this: The presentation is usually what makes the painting and adds value and sophistication to the artwork. The style and personality of the artwork is enhanced and expressed by the use of frames. After seeing large canvases left unframed [perfectly acceptable], I still prefer a framed piece. The style of a frame should complement the style of artwork. A barn wood frame would be suitable for a country landscape, but not a contemporary abstract piece. A smaller scale frame can look sophisticated and futuristic. Color can be determined quite easily if you are hanging the painting in a room with a particular color scheme. Frames described as “floating” do not touch the canvas; the canvas is recessed into the frame. There are an additional 55 frame options sold by the inch. *Samples available upon request, or visit our showroom to see the selection. Let us help you in selecting the right frame for your art. Or, simply send me a photo of the piece you’re considering and I’ll help you select the right frame. I. FLAT RATE ON ANY SIZE PAINTING – FRAME YOUR HEART OUT. FRAME YOUR ART $250.00 – ANY SIZE PAINTING. 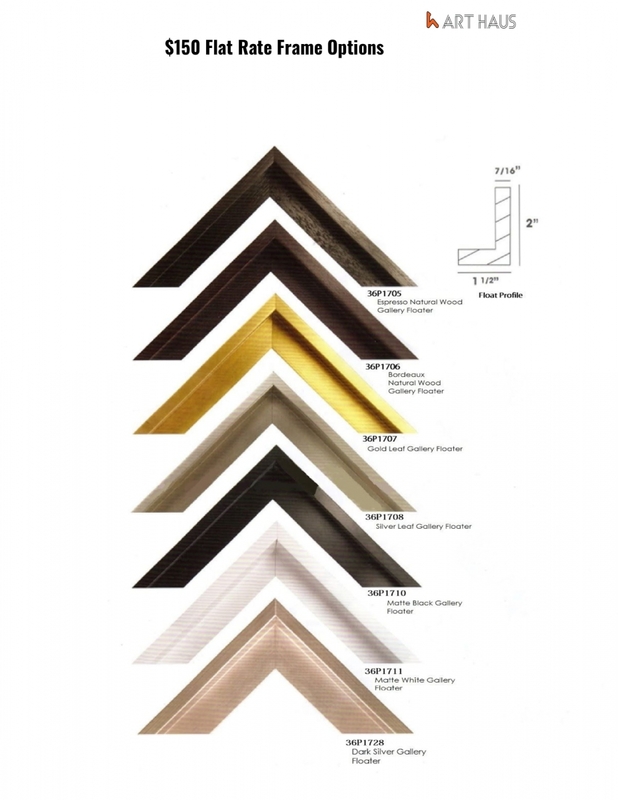 Choose from custom frames quoted “unit inch” – length + width x cost per inch. Samples ordered upon request. Profiles and images in each book. First, let’s quickly define each. A frame is not only the four pieces of wood (or other materials) that surround the border of a piece, but also the backing that provides structure and support to your artwork. Gallery wrapping [image below] is when the artwork is stretched and affixed onto stretcher bars.